It's difficult, I spend a day on just 1 proof. I did just read, however, Johnathan Strange and Mr Norrell, by Suzanna Clarke, which I frankly thought was amazing. Written in the style of a Victorian novelist, it's by turns a fantasy, fairy tale, comedy, drama and romance, and is (to my great joy) the kind of story that can only be told by a book. I just finished The Idiot a few days ago and Freethinkers a few days before that. Both were excellent. I also read Lovcraft's The Colour out of Space. Again, excellent, and very very chilling. I'm now going to be starting on Bulgakov's The Master and Margarita (translated by Pevear and Volokhonsky) and Oren's Power, Faith and Fantasy and will be restarting on first volume of Nicholas Boyle's Goethe biography. John Irving's The World According to Garp and Portnoy's Complaint by Philip Roth, both are good books so far, but im biased towards Irving. I'm reading the memoirs of David Dubal about Vladimir Horowitz. It's called "Evenings With Horowitz." Luckily they just stick to the music. Which part are you re-reading? I cant give you an english/latin equivalent to the author's name, nor to the title; i cant really speak english, and i know nothing about latin. Those of you who are familiar with antique Greek/Roman philosophy probably know who he is/was. Maybe Lucrecius "Of Nature"?!! I like it. He has a very poetic, deep and elegant way of speaking about Nature. Gary Gallagher's course looks outstanding Dave....did you have to pay the $129 for the dvds? Have you read the Foote material that BWV was discussing? It is absolutely the best overview of the American Civil War I have ever read. Even blew away Bruce Catton's overviews IMHO. The opening of Foote's third volume may in fact be the best nonfiction writing I have ever come across. I am in a very low-key re-reading of Crime & Punishment. Although, on one hand, I am finding it brilliantly written, and I could simply stay up all night and finish it off . . . I am allowing it to breathe, and I do savor it. Bill - good morn to you; yes, I read the Foote volumes many years ago (no longer have them, but probably should buy them again for a re-read; he was just an outstanding 'story teller' - love him on the Ken Burn's series on the Civil War, which would be my recommendation for a 'video' set to those just getting into this period of American History). 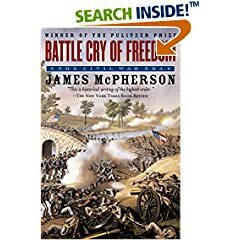 The Foote series may be somewhat 'daunting' for those wanting an introduction to the American Civil War; although innumerable books exist on this subject (and numerous sub-topic), my 'one-volume' recommendation would be Battle Cry of Freedom by James M. McPherson (published in 1988) - winner of the Pulitzer Prize and now an inexpensive paperback. Just started it....again. Was going to read it some time ago, but got sidetracked with other reading. However picked it up again and just finished Chapter 1 last night. A good read so far....I am especially fascinated with the portrayals of Seward and Chase so far. Thanks for the info. By the way, the Foote series in hardback is on sale at Amazon. I may replace my paperbacks with them. Of course it's good, otherwise I would not have read it a few minutes ago. And it's good because it's not about War, but Peace! This afternoon I spent less than hour watching my lasted DVD purchase: An Elegy for Allen Ginsberg and the next logical step was to reread his 'Howl', prominently mentioned and intelligently discussed by William F. Buckley, Philip Glass and many other of his friends. Who are they? The Fuggers? Their family started in the 16th century and still some of them around, but I didn't know they were in the recording business!